Only in New York a cultural site of such significance can go mostly unnoticed - and not only not only by tourists, but by New Yorkers as well. This is really a hidden gem in Washington Heights. 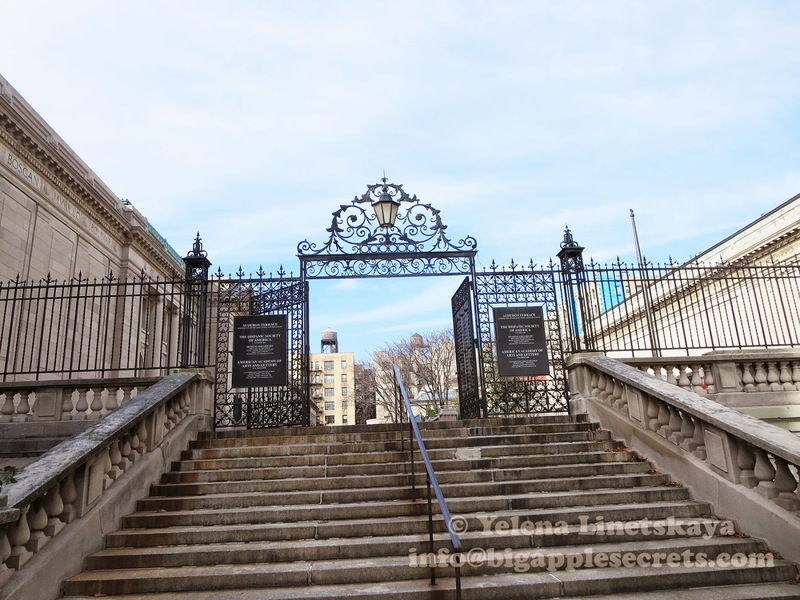 If the museum, and especially the courtyard, were near Central Park, it would be one of the City's most visited attractions. By the way, it is free! You'll very likely be alone viewing works by Goya, Velasquez, and El Greco as well as a stunning collection of Spanish earthenware from the 16th through the 19th centuries. Walking into the complex from the street, there was almost a ghostly feeling permeating the atmosphere. 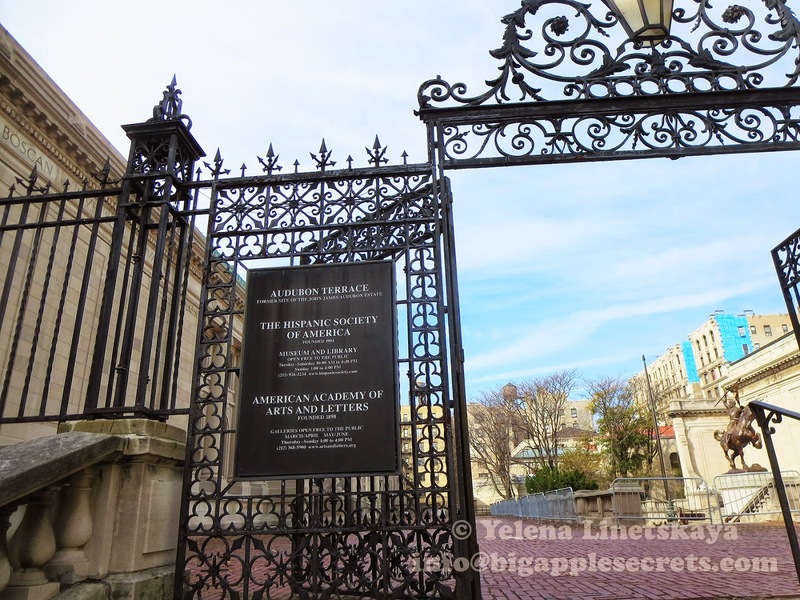 The Hispanic Society of America was founded on May 18, 1904, by Archer Milton Huntington, the stepson of railroad magnate. 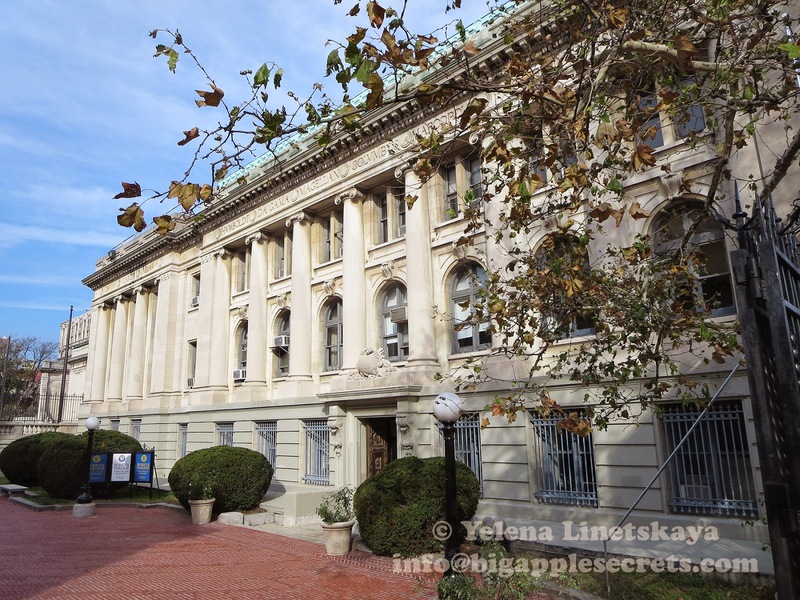 It is located on Audubon Terrace between 155 and 156 Streets in the Upper West Side in the Beaux-Arts building that dates from 1908. Huntington had been thinking about building a museum since he was a child, when he used boxes as gallery rooms and pictures cut out of magazines. Archer spent a year learning Arabic and Spanish in preparation for his first journey to Spain. He traveled often to Spain, collecting books, manuscripts, art, ceramics, textiles and coins. The master plan for the site was drawn up by his cousin, architect Charles P. Huntington. Archer Huntington took a deep personal interest in the details of every aspect of the building and design, even going so far as to design his own cases for the museum’s collection. 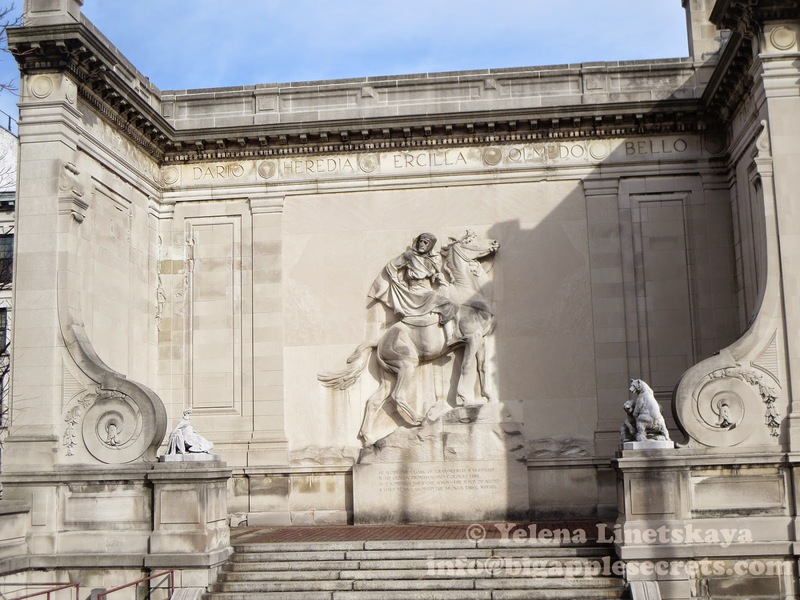 In 1904, Huntington’s collection included not only sculpture, paintings, maps, and archeological artifacts but also an extensive library, containing approximately 40,000 books . Audubon Terrace was named for naturalist and artist John James Audubon. His book "Birds of America" , printed between 1827 and 1838, contains 435 life-sized watercolors of North American birds, all made from hand-engraved plates, and is considered to be the archetype of wildlife illustration. With the success of the book, Audubon purchased a 14-acre estate along the Hudson River north of New York City. 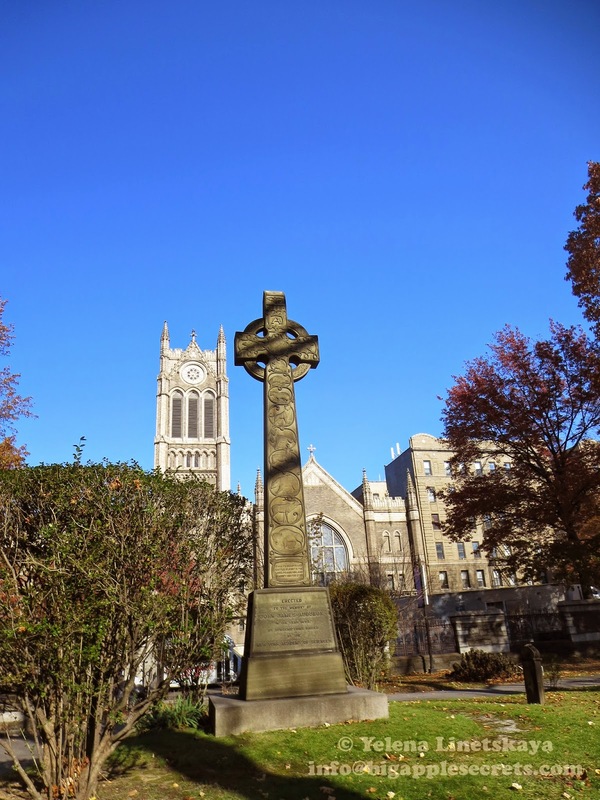 Part if his estate he donated for the Trinity Church Cemetery in which he is now buried. 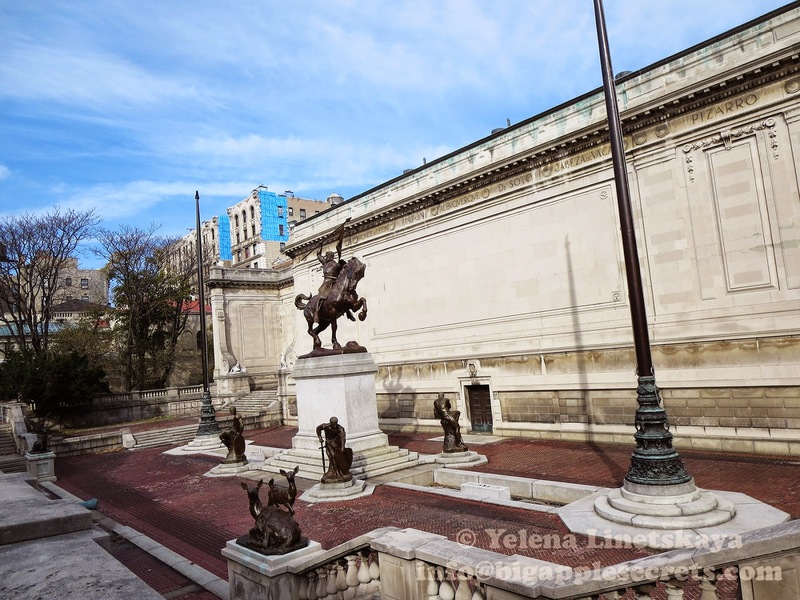 The museum sits behind two sets of wrought-iron gates in a plaza with a statue of El Cid(a Castilian nobleman and military leader in medieval Spain ) created by Anna Hyatt, the wife of Archer Huntington. 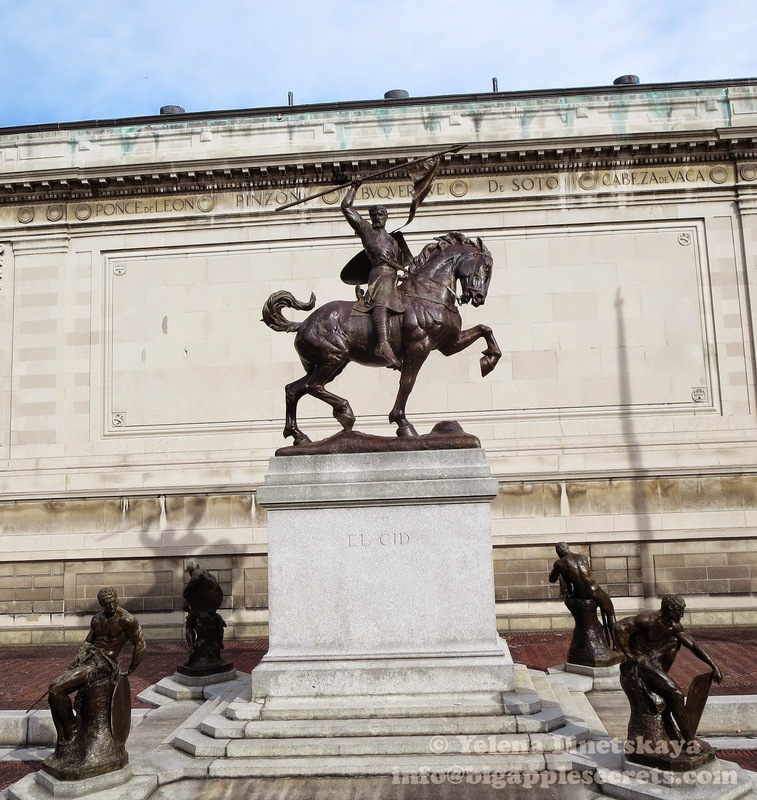 This heroic equestrian figure is surrounded by four smaller bronze statues of seated warriors. On either side is a small reflecting pool linked to the sculpture group by two flagpoles on bronze bases, also designed by Anna Huntington. There are also reliefs of Don Quixote and Boabdil done by Anna She was the first woman artist to be elected to the American Academy of Arts and Letters. 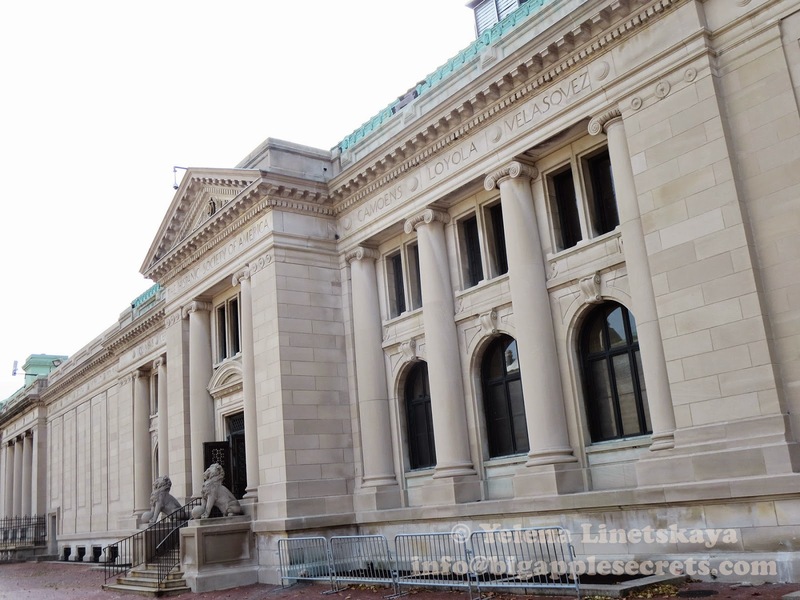 Soon the Museum of the American Indian, the American Geographical Society and the American Numismatic Society relocated, leaving behind only their deteriorating buildings. 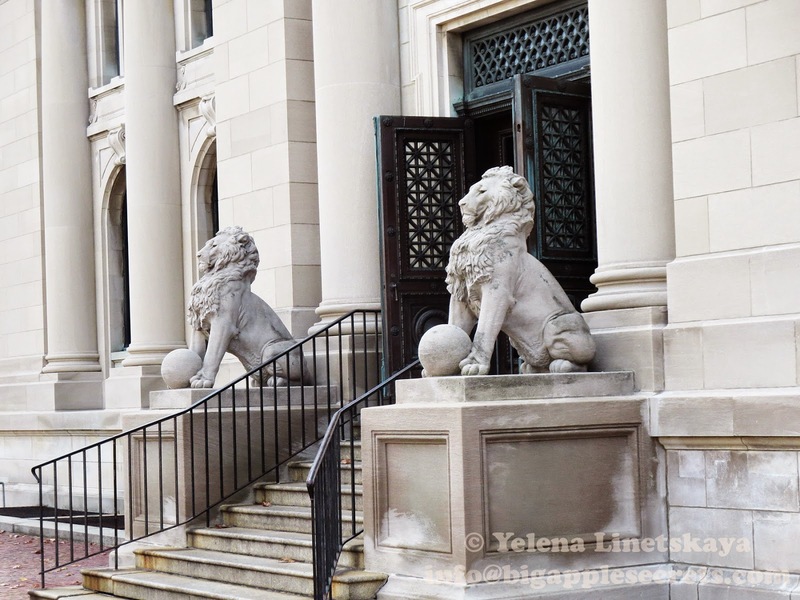 The American Academy of Arts and Letters remains on the terrace but is open to the public only a few months a year. Boricua College, a private school, occupies the former Geographical Society building. Between 1907 and 1930, The Hispanic Society of America was the foremost institution promoting Hispanic culture in the United States. When the Met sought to display the very best artifacts in its new Islamic galleries, it went to the Hispanic Society to arrange loans for 27 of its works. The museum averages now are only 20,000 visitors a year, down from about 50,000 annually in the mid-1950s. What a shame! In my next post I'll tell more about museum collections - paintings, ceramics, sculptures.